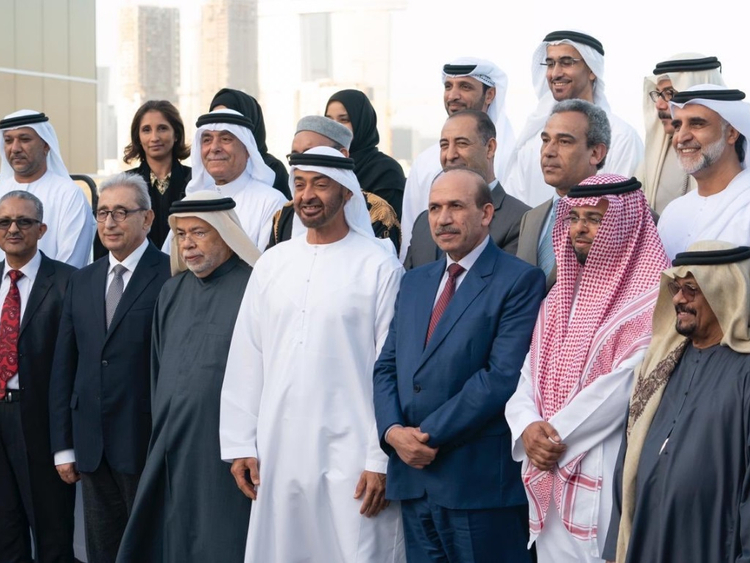 Abu Dhabi: His Highness Shaikh Mohammad Bin Zayed Al Nahyan, Crown Prince of Abu Dhabi and Deputy Supreme Commander of the UAE Armed Forces, on Monday received the participants in the 27th conference of the General Union of Arab Writers in Abu Dhabi. The conference was hosted in the UAE capital on January 19-22, with the participation of 17 delegations representing 17 federations and associations. They were accompanied by Habib Al Sayegh, Secretary-General of the General Union of Arab Writers, and Chairman of the Emirates Writers Union. Shaikh Mohammad underscored the eminent role played by the intelligentsia and literati in underpinning national identity and values as well as promoting the culture of tolerance and peaceful co-existence in the region and the world. He also hailed their efforts to establish channels of communications and dialogue across the Arab region. "The challenges besetting the Arab region entail in-depth understanding of current developments, a task literati and intelligentsia are capable of performing to illuminate the society and boost public awareness of these challenges," he said. The participants expressed appreciation for Abu Dhabi's hosting of the conference, commending the State's role in promoting such initiatives that are conducive to consolidating the cultural scene across the Arab nation. They praised Shaikh Mohammad's support for intellectuals and literati. Attending the meeting were Shaikh Hamdan Bin Zayed Al Nahyan, Ruler's Representative in Al Dhafra Region; Dr. Amal Abdullah Al Qubaisi, Speaker of Federal National Council, FNC; Lt. General Shaikh Saif Bin Zayed Al Nahyan, Deputy Prime Minister and Minister of the Interior; Shaikh Hamed Bin Zayed Al Nahyan, Chief of the Abu Dhabi Crown Prince's Court; Shaikh Khalid Bin Zayed Al Nahyan, Chairman of the Board of Zayed Higher Organisation for Humanitarian Care & Special Needs, ZHO; Dr. Shaikh Sultan Bin Khalifa Al Nahyan, Adviser to the UAE President, along with a number of Shaikhs, officials and UAE citizens. Is eczema affecting your quality of life?